In the newly opened Innovation Lab at Benchmark School, students garner knowledge and build essential life skills through meaningful, hands-on experience. “It started with two questions,” says Emma Mattesky, director of innovation at Benchmark School in Media: How might we create opportunities for students to develop the skills and mindsets needed to understand how the world works? How might we prepare students to contribute to society in a meaningful, empathic way? From this initial inquiry and additional ideas from the Benchmark community, the Innovation Lab began to take shape. 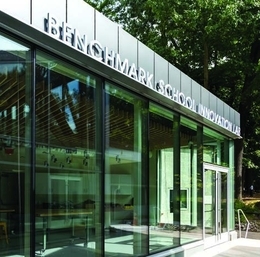 Although the physical structure is new, Benchmark School has been employing innovative, research-based teaching and learning strategies since the school’s inception in 1970. Mattesky sees the Innovation Lab as “a new layer” to the school’s educational principles. “This new layer involves the design thinking method of problem solving and reigniting the age-old constructivist philosophy of learning,” she explains, describing constructivism as “the belief that learning is inherently diverse.” Put another way, this philosophy upholds the notion that people learn in different ways, including garnering knowledge through experience. Having a new space for creating projects has stirred excitement among students and faculty alike. Teri Watkins, a lower school science teacher, appreciates “having a place to explore design thinking.” Philip Ruth, a math specialist, expects the space will allow him to “provide alternate project-based assessments for the middle school and ways to provide the reinforcement of concepts for the lower school.” He’s also excited at the thought of using the lab to work with students on various problem-solving activities. By combining a new lab dedicated to exploration, design, and creativity with the school’s transformative program for developing confidence, strategic knowledge, and self-regulation, Benchmark continues to lead the way in innovative education. While students get to explore, design, and create with sophisticated software, Gaskins says they also acquire essential tools and strategies such as confidence, empathy, and persistence, as well as critical thinking, collaboration, and resilience. “These are tools that not only facilitate innovation, but they can be applied in any context,” he adds.